Follow this walkthrough to display your office’s climate on your TV dashboard. While the temperature and humidity of your workplace probably aren’t your most important business KPIs, at Geckoboard HQ we’ve found displaying temperature useful for resolving differing opinions of whether the air conditioning should be on or off! There’s a huge choice of sensors on the market. Temperature’s the most useful, but you could go all fancy and get pressure and humidity too. For this walkthrough we’re using a Pimoroini BME680 breakout board. It’s small, cheap, well supported and comes with temperature, humidity, pressure and air quality sensors. You'll need to solder on the header board but that’s part of the fun. Don’t be daunted, you can do it as a complete beginner – just keep your appendages away from the hot bit! We’re big fans of Raspberry Pis – the Zero W is perfect for this – but there are lots of alternatives like the Particle Photon. For the brains of the operation we went for a Raspberry Pi. We went for a Model 3, as it’s what we had lying around, but a Zero W would have been a cheaper and more compact option. Any Pi should do, but it’s easier if it’s one of the models with Wifi built in. If you’re starting out, buying a kit complete with a power supply and HDMI/USB dongles is usually a good idea. You'll need a way of connecting your sensor to your microcontroller/computer of choice. 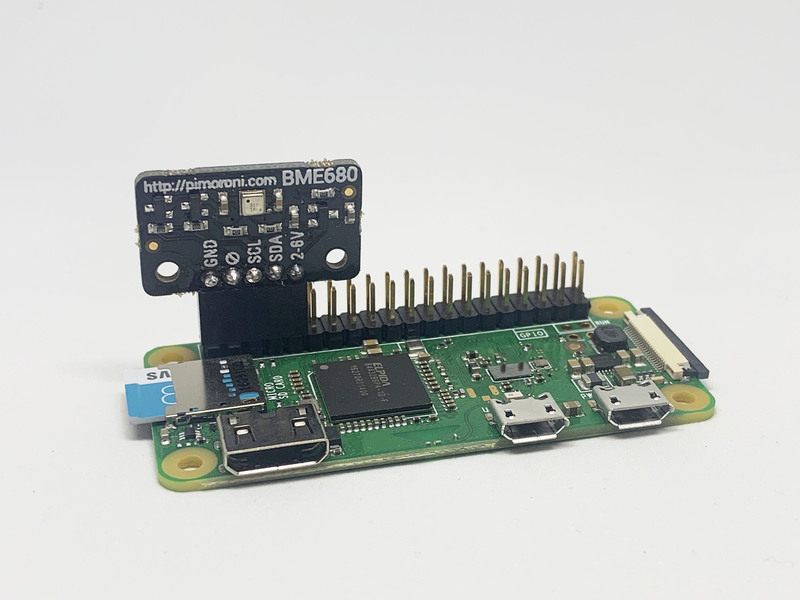 The BME680 has been designed so you can plug it directly into the Pi without any connecting wires, but if you want a bit more flexibility you’ll need a few jumper wires. Make sure to buy the right gender, this will depend on what header you put on the Pi and break out board. You might also want a case for the Pi. We like Pimoroni’s Pibow cases, but there are some really fancy cases out there like the Anidees aluminium case if you want to go all out. If this is your first time using a Raspberry Pi follow these instructions for getting set up. For this initial set up life’s a lot easier if you have a keyboard, mouse and screen to plug directly into the Pi. Also, if you’re picking up Pi that’s been hanging around for a while, make sure you update it. It makes a lot of problems just go away! Once you’ve got the operating on system on the Pi installed connect it your WiFi. It’s also a good idea to change the Pi’s password. At this point you can enable SSH if you like and program the Pi remotely from your usual computer. This means you can unplug the screen and keyboard attached to the Pi. Now the Pi’s all set up it’s time to get your sensor working. For the Pimoroni BME680 follow this getting started tutorial. Once you’ve reached the Running the built-in example and burning in the sensor step, you’ll be able to see the sensor working - hooray! You’re now ready to move on to sending the data to your Geckoboard dashboard. Enabled I2C. You can use this to check if the Pi’s seeing the sensor. Given it’s what we’re using to read the sensor values, we'll use Python for sending the data to Geckoboard. First you’ll need to head to the terminal and install the Geckoboard Python library. The .py is important. Without it you’ll end up with the wrong library. Next you’ll need to find your Geckoboard API key. If you’ve not yet got a Geckoboard account, now’s a good time to sign up. # Set up Geckoboard connection (This is where you need to put your API key). # Look for a dataset with the following name and if it doesn't exist create it. # Here we tell Geckoboard what schema to expect. Ensure that you replace YOUR-API-KEY-GOES-HERE with your API key. Look for the comments to the code explaining what the various parts do. Datasets requires you to define a schema - what data of what type to expect. You also need to tell it what the primary key is. Head over to Geckoboard and start to add a new Dataset widget. You should see the environmentreadings dataset with one reading. Add a line graph or number widget to your dashboard. Run the script again on your pi with python gecko-weather.py and you should see your dashboard update almost instantly – Success! Obviously you don’t want to have to run the script manually every time to log a new reading. We could put our script in a loop with a delay but instead to get it to update automatically we’re going to use Cron. The pwd command is useful for finding the full path of a file. If your Pi’s set up differently, you may also need to change the python path from /usr/bin/python. You can check your Python’s location by running which python in the terminal. If you want to change the frequency your script runs you’ll need to change the * * * * *. Currently it updates every minute. Read more about configuring cron jobs using the cron command. Once you’ve saved the Cron file the script should run. Watch the data roll in! And that’s it! Sit back and enjoy your up to the minute environment data. Why not now experiment with different visualizations?